This is about a month late, but I wanted to share what I made at the cabin for my anniversary earlier this month. My heart was set on barbecuing because I don’t get enough of it living in an apartment. Also, there’s something intensely satisfying about grilling meat on an open flame (says the former vegetarian). This dish was inspired by a steak salad that I had at Hermanos this summer. It’s a refreshing salad made with butter lettuce and grilled meat and veggies. All the grillables marinated in an oil and vinegar blend for a few hours before they got skewered and thrown on the bbq. I made a lemon-potato side dish because of the overwhelming amount of potatoes I had at home. They were aaaaaaaamazing! We pan-fried the leftovers the next morning for breakfast and I highly recommend finishing them in a pan if you like a crispier tater. 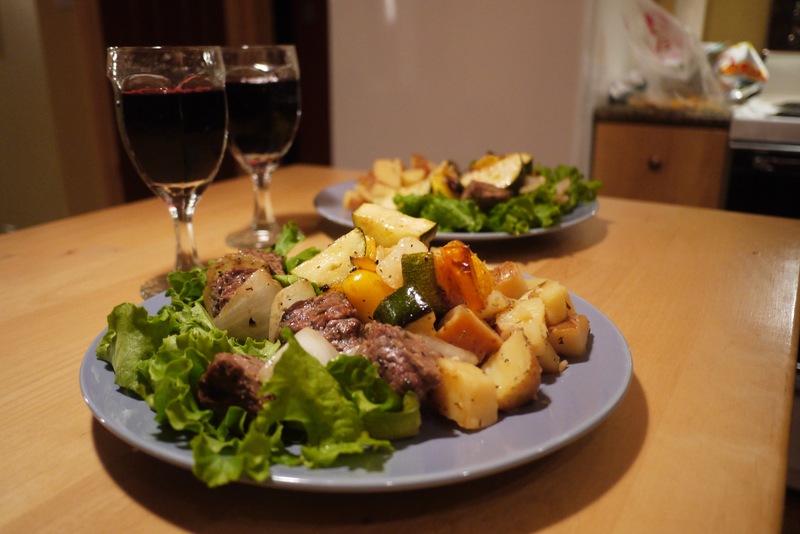 I found the potato recipe here and the marinade for the meat and veg was my own creation. Cut all of the meat and veggies into bite-sized pieces. Add all of the marinade ingredients to a lidded container or a ziploc bag. Add the meat and vegetables to your vessel of choice and shake until the ingredients are covered with the marinade mixture. Let sit in the fridge for 30 minutes to several hours. 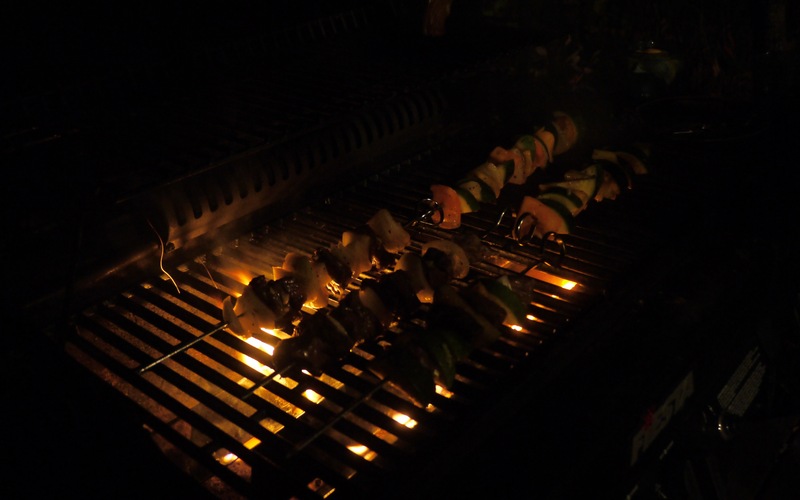 Turn barbecue to medium-high and cook skewers until the meat is cooked and the veggies are tender, about 10-15 minutes. Enjoy as skewers, or wash and tear one head of butter lettuce and toss ingredients together to make a super tasty salad. There’s no need for a dressing because the shish kebabs are so flavourful already. 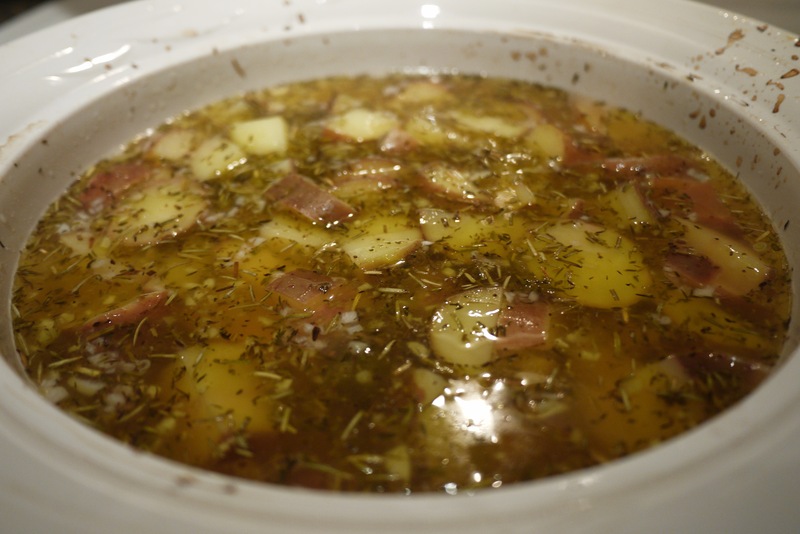 In a small bowl, mix olive oil, water, garlic, lemon juice, thyme, rosemary, bouillon cubes and pepper. Arrange potatoes evenly in the bottom of a medium baking dish. Pour the olive oil mixture over the potatoes. Cover, and bake 1 1/2 to 2 hours in the preheated oven, turning occasionally, until tender but firm.